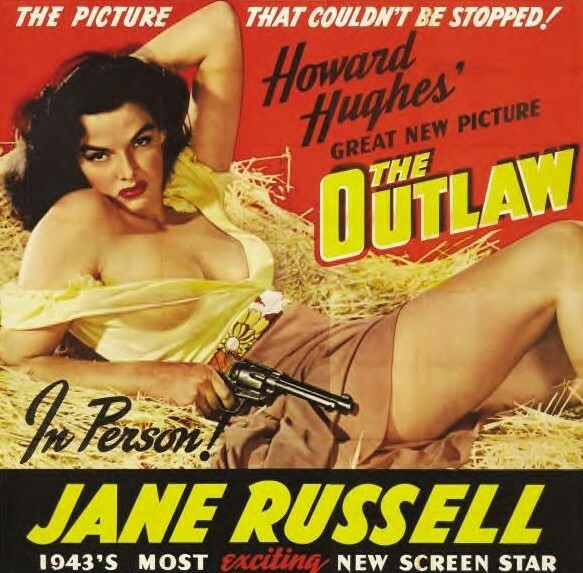 In 1941, Director Howard Hughes, while filming the movie The Outlaw, felt that the camera did not do justice to Jane Russell’s large bust. He employed his engineering skills to design an underwired, cantilevered bra to emphasise her assets. Hughes added rods of curved structural steel that were sewn into the brassiere below each breast. The rods were connected to the bra’s shoulder straps. The arrangement allowed the breasts to be pulled upward and made it possible to move the shoulder straps away from the neck. The design allowed for any amount of bosom to be freely exposed. Regardless, the emphasis on her breasts proved too much for the Hollywood Production Code Administration, which ordered cuts to the film. To obtain the Boards’ required Seal of Approval, Hughes reluctantly removed about 40 feet, or a half-minute, of footage that featured Jane Russell’s bosom. He still had problems getting the film distributed, so Hughes schemed to create a public outcry for his film to be banned. The resulting controversy generated enough interest to get The Outlaw into the theatres for one week in 1943, before being withdrawn due to objections by the Code censors. When the film was finally released in 1950, it was a box office hit. This entry was posted in 50S, 60'S, Books, Confessions of a hollywood agent, Elvis Presley, Hollywood, Hollywood Agent, JFK, Novels and tagged 50's, 60's, hollywood, Jane Russell, orphanages. Bookmark the permalink.